How to Schedule a Lesson for the first time. 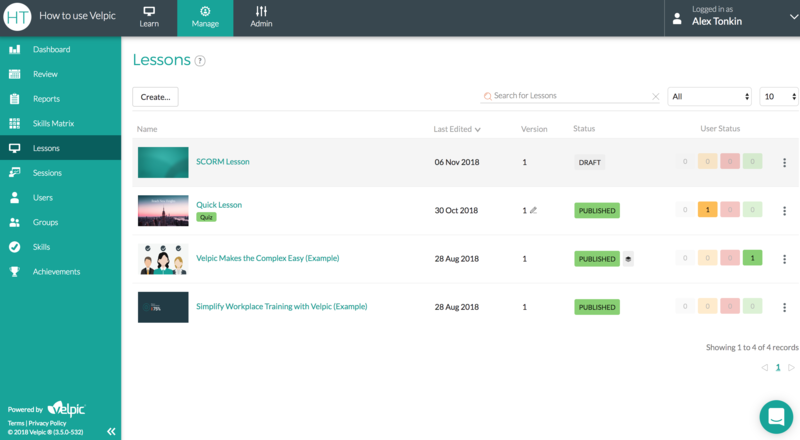 Go to the Lessons List page under Manage then Lessons. This is the default page for new signups. 2. To preview the lesson, click on the image for the lesson to watch a preview. For example, "Velpic Makes the Complex Easy (Example)"
3. Let's say we're happy with this lesson and want to distribute it as mandatory training for ourselves. 4. Click on the Lesson Name. For Example "Velpic Makes the Complex Easy (Example)". This brings up the Lesson Details page. 5. Click the "Scheduled Users" tab. 6. 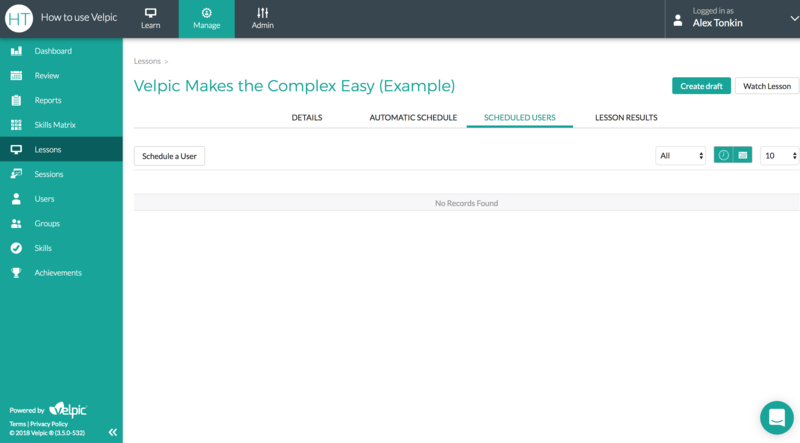 Click "Schedule a User". 7. Select your name from the list. 8. 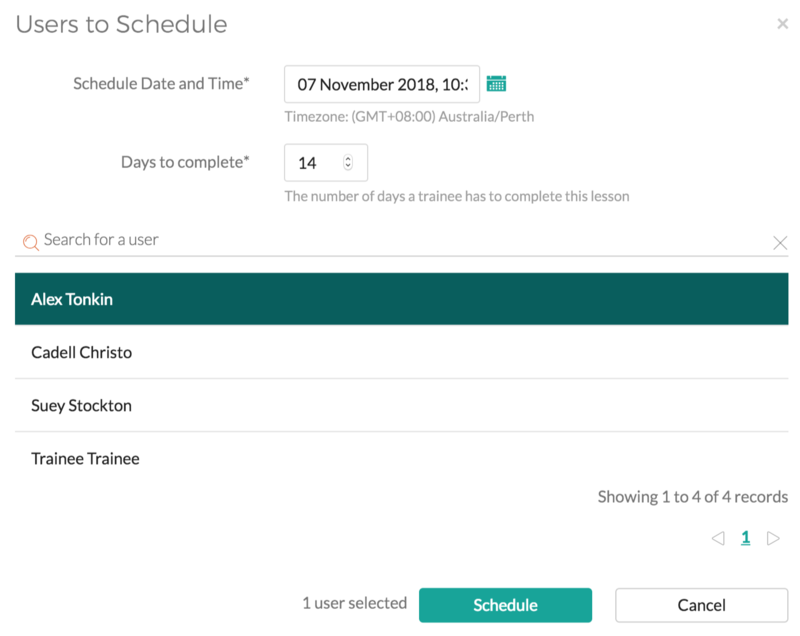 We can also search for users, select multiple users, change the scheduled data and the time allocated to complete the lesson before it is overdue. 9. Click "Schedule". This brings us back to the Scheduled Users tab which will refresh to show the newly scheduled user. The Trainee will be notified by email that a new lesson has been scheduled within 15 minutes of scheduling the lesson. You also have the option to turn off these notifications under Admin, Configuration, Notifications, Lesson Schedule Updates. 10. We also have some actions that we can perform on the Scheduled Lesson that we can see under the ellipsis (three dots) on the right. For more information see Manage Scheduled Lessons. We've just scheduled our first Lesson in Velpic.